Relocating an existing maintenance building will free up valuable space at the facility on Commercial Street. 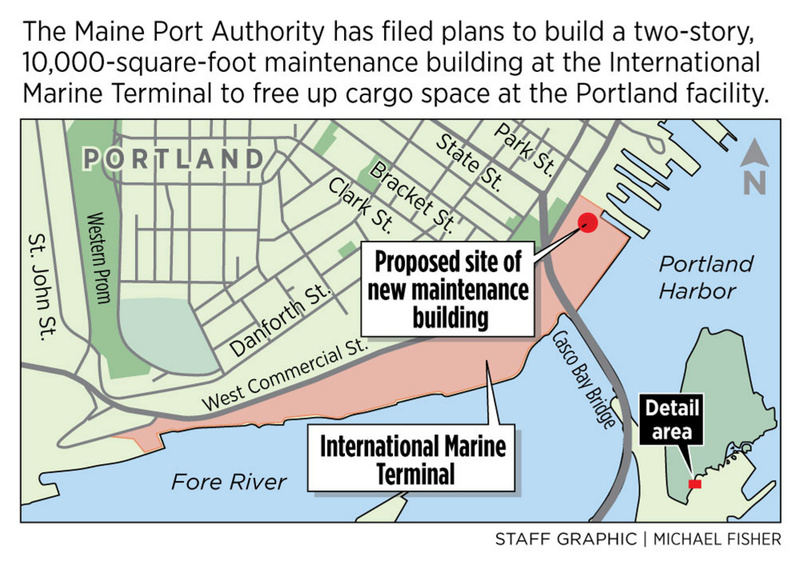 The Maine Port Authority is proposing to build a nearly 10,000-square-foot maintenance and operations building on Commercial Street in Portland to free up cargo space at the International Marine Terminal. An application filed this month with the city’s planning office by the Maine Department of Transportation outlines plans to construct the two-story building and add a 20-spot parking lot at the terminal near the Casco Bay Bridge. The proposed building would replace a similarly sized maintenance facility. There will be no change of use or expansion of operations because of the development, according to the site plan application. The existing maintenance building is closer to the waterfront and near the terminal’s crane. The new building would be built at the northeast corner of the property, next to the small office building that is the headquarters of the Maine Port Authority. The project is estimated to cost $3.1 million, funded with state bonds and a federal grant. Maine Port Authority Executive Director John Henshaw did not respond to an interview request on Tuesday. Moving the building will allow the terminal to reorganize operations slightly and open valuable space to store and move cargo and increase port efficiency, according to the application. The development is part of a $15.5 million expansion at the International Marine Terminal that will add a second mobile harbor crane and improve rail connections to the facility. Maine has invested heavily in the shipping terminal, the state’s largest, doubling the size of the facility about three years ago and attracting Eimskip, an Icelandic shipping company, to locate its U.S. headquarters in Portland. Container shipments have surged at the port, growing 1,300 percent from 2011 to 2015. State officials hope further improvements and the addition of a large cold-storage warehouse will increase container traffic through the port. According to the application, the new building will have more office space and training areas than the current facility. It will be designed to look like the nearby office, with a free-standing canopy between the buildings to link them together visually. The project will be reviewed by the city’s Planning and Urban Development Department.